MH CET Law 2019: MH CET Law is a state level Law Entrance Exam conducted by State Common Entrance Test Cell, Mumbai. MH CET Law Provides admission to the 3 years LLB and 5 Years Integrated LLB course. It is also known as Maharashtra Law CET. Many Colleges located in Maharashtra state consider MH CET Score for providing Admission. Latest Update:MH CET Law 2019 Admit Card has been released on 10th April 2019 for 5 year LLB. Latest Update: MH CET Law 2019 LLB 3 Years Registration dates has been extended again. Check the new schedule below. Latest Update: MH CET Law 2019 Last day of Registration as well as exam date for 3 years LLB has been extended. Check the schedule below. Latest Update: MH CET Law 2019 Application form will be available till 10th March 2019 for 5 year LLB and 15th March, for 3 year LLB. 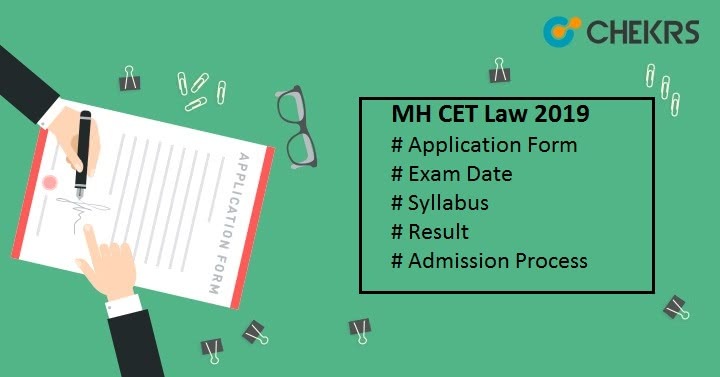 Latest Update: MH CET LAW 2019 Application Form Filling Procedure Started!! Check Official Notification. Latest Update: MH CET LAW 2019 Exam Date Announced!! Check the table below. MH CET Law Registration will be available in the month of March 2019 and exam will be conducted in April and June Month. In this article, you will find all the details about the Exam including dates and information for preparation. MH CET Law Exam Date will be announced by the Exam Authority in the beginning of the year 2019. Tentative MH CET Law Exam Dates are given below. Candidates must Check the below given MH CET Law Eligibility Criteria to be assured about their eligibility towards the exam. Nationality Indian, as well as Foreign/ OCI/ PIO/ NRI candidates, are eligible. Age Criteria There is no Age Limit. Appearing Candidates Appearing Candidates are also Eligible. The application form will be available on the MH CET Law 2019 Official Website online. It will be issued in the last week of March 2019. Candidates can apply for Maharashtra Law CET through the online mode. Click here to apply for LLB 3 year courses. Click here to apply for MH CET LLB 5 year courses. The application form will be available until the 1st week of April. Candidates can also do correction till the same date. Application form can be printed until last week of April. First of All, Candidates have to do Registration on the MH CET Official website, As Given just Above.. In the registration, candidates have to fill all the correct details. Because they will receive login details on their provided Email and Mobile Number. After receiving all the details candidates have to log in to the official website. After it they can access the MH CET Law Application Form. Provide all the asked details like Personal, Academic, and Contact details. Now Take a print-out and pay the fee. Application Fee can be paid through Online Mode only, IN this mode you can pay the Maharashtra Law CET Application Fee through Debit card/credit card/internet banking /IMPS/Cash cards/Mobile Wallet. Marking Scheme Each question will carry 1 mark and there will be no negative marking. MH CET Law Syllabus will be notified through the notification and website. Candidates have to follow the official syllabus for the preparation. However, the syllabus will be consist of the following topics/subjects. Take regular breaks in your study. Hall ticket will be released online on the MH CET official website Candidates need to Visit the official website and log in there to get the Maharashtra CET LAW Admit Card. The admit card is one of the most important document and it will be required at the examination center. So make sure to bring the Hall ticket with a photo id to the examination center. The MH CET Law 2019 Result will be probably released in June 2019. Result will be released on the official website. To Check the result candidates have to login to the official website and then they can access the Maharashtra Law Cet Result pdf. Click on it then Check and download the result. Authority will also prepare and release MH CET Law Merit List separately for 3 and 5 years LLB program. The Merit list will be category wised. Candidate will get rank according to their marks and cut-off. Candidates with more than or equal to Cut-Off will be listed on the Rank List. Candidates having the name in the rank list will be considered for the CAP. Online Centralized Admission Process (CAP) will be organized for Providing admission. In it, candidates have to fill their choices and on the basis of filled choices, Merit/Rank List, seat availability, and document verification, Maharashtra Law CET Admission will be provided to interested, eligible, and qualified candidates. After it, they need to report to the allotted college for further Admission Process.